It’s the height of summer, and you’re looking for something to spice up your campfire dinner of hot dogs and s'mores. Just because you’re roughing it, doesn’t mean you have to sacrifice your meals. Emma Frisch, co-founder and culinary director of Firelight Camps, a glamping destination in upstate New York, says your meals over a campfire are just as much a part of enjoying the outdoors as your hikes and canoe rides. "The fire still continues to be this place where … it just brings you back to this primal state that's deep inside all of us," she said. "And cooking over a fire infuses the food with this taste of smoke that I think all of us have in our bones." You’re present, and tuned into the process of cooking in a way that’s different than the kitchen, where you simply turn a dial on the oven to set the temperature, Frisch said. "It's really about paying attention to what's happening to the cooking source — the heat — looking at, you know, how hot the fire is based on the color of the coals, using a hand to sense the heat of the fire by just holding it above," she said. The trickiest part of cooking outside lies in the planning and packing phase, Frisch said. Your approach will vary, depending on whether you’re spending a weekend at a campground with children versus venturing into the backwoods. First, choose your recipes, then determine what equipment you need to bring and what elements of the meal you can prepare in advance, she said. Often, your list of equipment will be much smaller than you think. "I'm a huge advocate of less is more," Frisch said. "What's most basic is a good knife, tongs, a spatula, a grill grate ... and dishware because really if you are preparing things in advance and you have it ready to go, you can just throw it on the grill and that’s all you need." It can be as simple as putting sliced vegetables with olive oil, salt and pepper in a bag, then throwing them on the grill, she said. Or, something that might take a bit more forethought, but is nearly as simple, like Frisch’s Tiramisu French Toast. 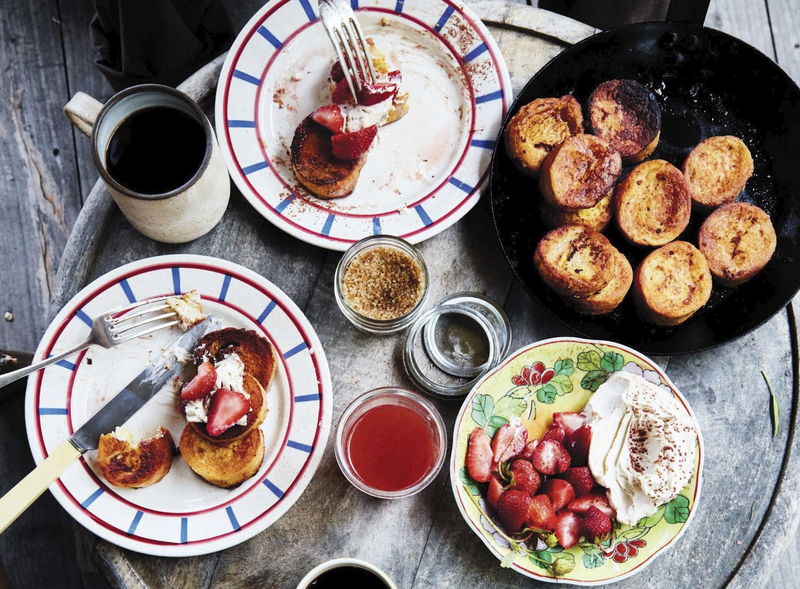 The French toast is made with a baguette so it can absorb all the egg custard in a bag or a bowl, while it waits to be cooked in a pan over the fire, and the tiramisu is made at home by whipping espresso honey and mascarpone together. "It’s actually one of the easiest recipes, but it just feels so luxurious, especially for kids," she said. While some campers use propane stoves or even small charcoal grills, Frisch’s favorite method is right over the fire, the right setup for her Fire-Licked Skirt Steak with Salsa Verde. "You can just do so much," she said. "You can rake coals to one side and bake potatoes in foil right on the coals, while on the other side you are grilling steak … over hotter flames. It sort of serves all of those purposes and you got that campfire feel where everyone’s gathered around and cooking and celebrating together." Finally, for dessert, Frisch prefers Cherry Bourbon Fool to the classic s’more. Make the whipped cream by shaking the cream in a mason jar with a marble, or a (clean) pebble you find at your campsite, until it turns into cream. "It's so fun and kids love doing it too," she said. "And then you whip in some bourbon and cherries and it's just so so good and so easy and so summer." You can find more of Kirsch's recipes in her cookbook "Feast by Firelight: Simple Recipes for Camping, Cabins, and the Great Outdoors."